WHYNOT – James Earl, 64, of Liverpool, passed away peacefully in Queens General Hospital on Sunday, September 2nd, 2012. Born in Liverpool, he was a son of the late Roger and Clara (Oickle) Whynot. 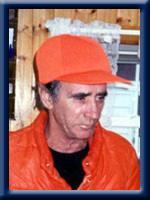 Earl was a former fish cutter for C. W. MacLeod’s Fish Plant in Port Mouton, Mersey Seafoods in Liverpool, Riverport Fish Plant and Polar Bear Fish Plant in Port l’Herbert. He enjoyed hunting and fishing in his spare time. He is survived by his companion Bonny Burns, his daughters Kelly Lynn and Clara Dawn, both of Yarmouth and his stepdaughter Teresa. His step- grandchildren Coady and Tiffany. His sisters Sylvia (Carl) Corkum of Camperdown, Betty Ross and Evelyn Everett, both of Liverpool, Christina Slauenwhite of Vogler’s Cove. His brothers Borden (Carol) and Max (Etta), both of Liverpool and Dennis (Gloria) of Hunt’s Point. He was predeceased by his brothers Roger and Eldon. Bonny & Earl’s Family, so sorry for your loss…Earl is Free from Pain, and suffering no more…keep his memories close as they will bring you comfort! We are so sorry for your loss our thoughts and prayers are with you all. So sorry to hear of Earls passing,The Post Office in the mornings will never be the same.R.I.P. Earl. Irving Whynot and family. I am so sorry to hear of Earl’s passing. My condolences to his friends and family. I would see him at the post office often chatting with his buddies. He will be missed. Bonnie my thoughts and prayers are with you at this sad time. Earl was one of a kind! Take care and remember the good times you both had. I will miss seeing Earl around town, but am glad that he won’t suffer anymore. My thoughts are with his family at this time of loss. Sorry to hear of Earl’s passing, he was a well known figure around town and especially at the post office.My thoughts are with Bonny and all of Earl’s family at this sad time. Bonny, I am sorry to hear about Earl’s passing. I am thinking of you at this sad time. Sorry to hear about earl, we had a lot of good times and shared a few beers together. RIP my friend! Bonny and Family, I am so sorry for your loss. Stay strong at this hard time. Thoughts and prayers sent your way. I am so sorry to hear of Earls passing. R.I.P Earl. Take comfort in knowing he’s not in pain and is in heaven with loved ones. So sorry Bonnie to hear of Earl’s passing..he was a good friend to us both,Mike valued his work on his boat when they fished together….he will never be forgotten by his friends which we had the privilege to be. Also to his cousin Pamela Everette,you were always good to Earl and for that we are thankful……rest in peace Earl ,you’ll never be forgotten.Mike & Sandy. R.I.P. earl were miss you but your not in pain anymore.i give your smoke i hope you enjoy. So sorry for your loss. Be comforted by your memories and the end of suffering for someone dear to you. We are sorry for your loss. Our thoughts and prayers are with you all . To Bonnie and Earls family we were sorry to hear about Earl passing, he was a nice little fellow .loved music and was always there to help,if you needed help. RIP Earl, you will be missed by many. Sending you all my prayers. Find comfort in your memories. To my family – I am very sorry for your loss. Also, sorry I am unable to attend the service tomorrow. I am thinking of you all. never a day goes by that you’re not in my heart and my soul. Max ,Etta and Family,My thoughts and prayers are with you all. Very sorry to hear of Earl’s passing. My thoughts and prayers are with you. Sorry to hear of Earls passing. My thoughts and prayers are with you at this time. Bonnie and Earl’s family, sorry to hear of Earl’s passing. My thoughts and prayers are with you at this sad time. He is already being missed at the post office.